Maha Shivaratri recipes you must try on this auspicious day! There’s a belief that the mighty Hindu God, Shiva is easily pleased by his devotees. The Lord asks for no great food or embellishments. It’s the depths of devotion that pleases him the most. Hence, just a little bit of water and milk is enough to please him, if offered with uncorrupted devotion. And yet, his devotees decide to hold a mega affair on the auspicious day of Maha Shivaratri as an expression of gratitude to the lord. They fast whole day, stay awake the whole night, perform Abhishekam with milk, curd, ghee, honey and Bilva Patra, and also prepare neivedyam for Lord Shiva. Not to mention, like every other religious festival in India, food plays a vital role in Maha Shivaratri too. So, we thought of bringing you a couple of quintessential Maha Shivaratri recipes prepared during Shivaratri. And that’s not all. There’s a bonus Maha Shivaratri recipe for fasting as well. Roast the chana dal until it exudes a sweet aroma. Grind the roasted dal along with the cardamom cloves into a fine powder. Roast the poppy seeds until they splutter, giving out a nice aroma. Take care not to burn the seeds with overheating. Next, roast the dry desiccated coconut until crisp. Let it cool down a bit. And then grind it into a coarse powder. Heat the ghee in a thick pan. Stir in the jaggery. Keep stirring on medium flame until the jaggery dissolves, forming bubbles. Add the coarsely ground coconut, followed by the poppy seeds. Give it a quick stir. Finally, empty the powdered chana dal into the pan and put off the flame. Mix it thoroughly. Add some extra ghee in case you feel the mixture is too dry. Take small portions of the mixture in your hands and make the Tambittu or ladoos. 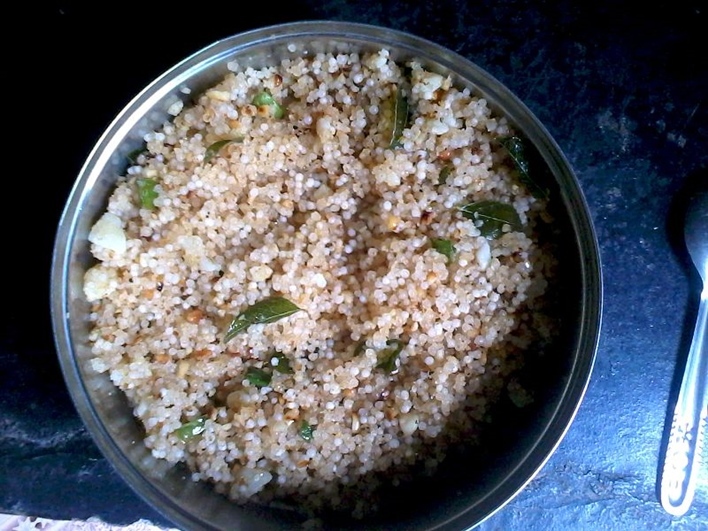 One of the Maha Shivaratri recipes is ready! Cashew nuts (broken): 1 tbsp. Clarified butter (ghee): 2-3 tbsp. Soak the rice and the lentils in water separately for 2 hours. Place the soaked rice on a plain sheet of paper for half an hour so that the excess moisture is soaked. Roast the rice until it turns light golden. And then grind it into a coarse powder. Drizzle some boiling water into the rice flour to give it a moist consistency. Make sure that it’s as moist as to hold its shape when pressed with hands and as dry as to crumble when pressed harder. Next, grease the idli plate with a hint of ghee and spread the rice flour on it. Steam it for 10-15 minutes. While the rice gets done, pressure-cook the soaked chana dal to a single whistle. The dal should not get overcooked. Cook only till it blossoms. Meanwhile, transfer the steamed rice on to a plate. Spread the rice and let it cool down for sometimes. Crumble the lumps with your fingers until there isn’t a single lump left. Add the boiled chana dal into the rice flour and mix. For the jaggery syrup, put the grated jaggery into a thick pan and add just enough water to it. Let it come to a boil. Strain the impurities, and bring it to a boil again until the syrup turns thick and frothy. Sprinkle a pinch of salt and cardamom powder and mix well. Remove the syrup from heat. Now, slowly add the jaggery syrup into the rice flour mixture little by little and mix well. Heat ghee and golden fry the broken cashew nut pieces. Transfer them into the rice mixture. Sprinkle a little cardamom powder for extra flavor. The neivedyam is ready to be offered to Lord Shiva! Soak the sago in water for 3-4 hours. Make sure not to use water more than required to immerse the sago completely. After 3 hours, the sago will absorb all the water and appear soft and puffed up. Drain excess water if any. Roast the peanuts slowly on low flame. Once it’s done, peel off the skin and crush them coarsely. Boil the potato, peel the skin, and cut it into equal-sized cubes. Grate ginger. Chop the cilantro and the green chilies. Heat the refined oil in a thick bottomed pan. Add cumin seeds followed by the curry leaves and grated ginger. Next, stir in the potato cubes. Sprinkle salt, turmeric powder and chopped green chilies. Panfry the potatoes for some time. Add the sago pearls into the pan and combine it on low flame. Cook until the sago pearls turn translucent. Remember that overcooking will make it lumpy and sticky. Finally, stir in the grated coconut and crushed peanuts and mix well before shifting it from the flame. Garnish with chopped cilantro and a drizzle of lemon juice.